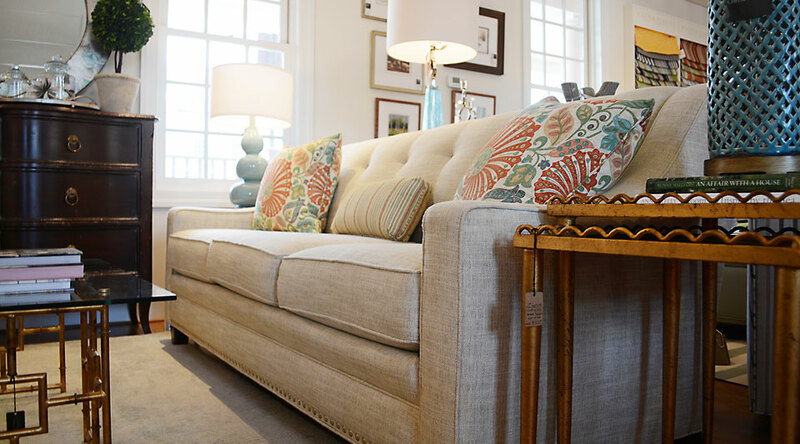 Looking for the best selection of Fine Furnishings and Accessories in Northern Virginia? Look no further. The Guest Room offers a wide array of top quality, trusted brands that are handcrafted in North America. We also offer a variety of decorative accessories and art work to complete the look of your room. Designers welcome! The Guest Room offers a wide selection of top quality, trusted brands that are handcrafted in North America. We have decorative accessories, bedding and local art work to complete the look of your room. We believe that creating a beautiful, comfortable home is important. The right design, color scheme, furnishings and details can transform any home into an inspiring and livable space. We believe that creating a beautiful, comfortable home is important. That’s why we’ve been helping customers for over 16 years. Come in and be a guest in our home. Let us help you create the perfect room. We are so proud to share that The Guest Room recently received an A+ rating from the Better Business Bureau! We love being able to provide you with beautiful, high-quality furniture and we love doing it with a smile on our face! Thanks for being A+ customers! After looking several places for furniture, I discovered Guest Room Furniture in Leesburg, and what a great find that was!!! I have purchased both wood and upholstered pieces and have been delighted with the look and quality of the furniture. It met and exceeded my expectations and arrived much more quickly than other furniture I had previously purchased elsewhere. I love the quality of my furniture, but even more importantly the quality of the service and the knowledge, expertise, and helpfulness of the ladies with whom I worked. I felt like Connie and Lynne became my friends during the buying process. If I were to need additional furniture or accessories, The Guest Room would be the first place I would go. I have recommended The Guest Room to both friends and relatives, and they have been equally as pleased. Thumbs up for The Guest Room!! The furniture is exquisite (totally awesome). I still can’t get over how fine the craftsmanship is from the furniture builders from Simply Amish and Gat Creek. One of these days I need to order a new guest bedroom suite and when I do; I will buy it from you. Thank you and the guys who delivered the furniture today, everything exceeded my expectations. I just want to thank you again for your help in selecting our furniture. It fits very well and it looks great. Most of all it is very comfortable! We cannot be more delighted. I really appreciate your help on this. I am sending photos of our sitting room from my camera separately. I just wanted to thank you again. I cannot wait to come back for more pieces. P.S. Your delivery fellows were wonderful, too. Every once in awhile you find a special place to shop where you know the products and service are top notch. The Guest Room is my special place for furniture, accessories and design advice. Thanks to the knowledgeable staff and beautiful furniture, I have created several gorgeous rooms in my home complete with good looking accessories that add that special touch. From my family room to kitchen to home office the Guest Room look stands out. My special thanks goes to the staff that spent many hours helping me put together a timeless look that’s both comfortable and elegant. We discovered this gem a couple of years ago. The experience we have had with the The Guest Room has been very enjoyable and stress free!!! They source from quality manufacturers and we have always been extremely satisfied with the product we received. The design consultants understand the client’s taste and requirement very well and work with you with a lot of enthusiasm.You would be very happy you stepped in to this wonderful store in the heart of Leesburg. We were. – Bemal and Kapila G.